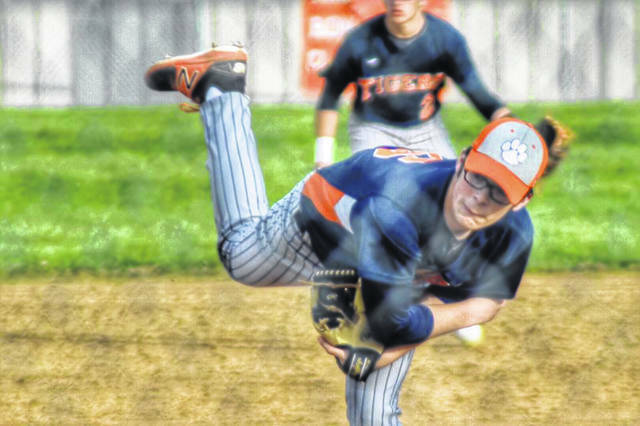 MANSFIELD — Back on Friday afternoon, the Galion Tigers baseball team traveled to Mansfield to clash with the hosting Senior Tygers for their second meeting of the 2019 season. In their first meeting, Galion cruised to a five-inning victory by a final score of 16-2. On Friday, it was a similar story as the visiting Tigers needed just five innings again to down their hosts, this time by a score of 14-3. With the victory, Galion improves to 10-1 overall and remain at 5-1 overall in Mid-Ohio Athletic Conference action. The Tigers racked up 15 hits en route to their 14 runs despite stranding seven runners on the base path. Senior scattered five hits to plate their three runs and stranded four. Both squads committed three errors in the field of play. Clay Karnes picked up the victory on the hill for Galion, tossing three innings, allowing two hits and an unearned run while striking out six. Jackson Staton tossed two innings on the day, giving up three hits and two unearned runs while walking one and fanning five Tygers’ batters. 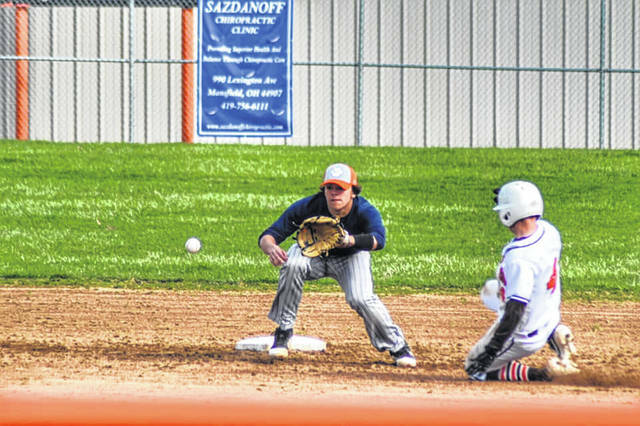 Markis Lawson and Brody Symsick led the Galion offense, both recording three-hit games. Both Lawson and Symsick ripped three singles apiece while Lawson scored two runs, drove in one and swiped a base. Symsick scored twice, drove in a pair of runs and stole two bases. Troy Manring, Ryan Utz and Cameron Payne also notched multi-hit games in the Tigers’ offensive explosion. Manring finished with a pair of singles, two runs scored and two steals while Utz belted a single and a triple while scoring three times, driving in a pair and recording a steal. Payne contributed a single, a double, scored twice and drove in a run in the victory. Other offense in Galion’s eighth consecutive victory came from: Gavin Pennington- 1B, RBI; Spencer Keller- R, RBI; Carter Keinath- RBI; Jacob Lear- 1B, R, SB; John Abouhassan- 2B, R and Staton- RBI. The Tigers had the rest of the weekend off before making their way back on the diamond when they headed to Bellville for a clash atop the MOAC with the Clear Fork Colts on Tuesday. Game two of the season series will be played in Galion on Wednesday and the Tigers will travel to Willard on Thursday, April 18 for a non-conference meeting with the hosting Crimson Flashes. NORTH ROBINSON — After finishing off the season-series sweep of conference foes, the Wynford Royals, the Colonel Crawford Eagles baseball squad returned to their home diamond on Saturday to clash with the visiting Willard Crimson Flashes. Crawford would have no issues with their guests, cruising to a 12-1 victory in five innings. With the win, the Eagles improved to 8-4 overall on the season and remain 5-3 in Northern-10 Athletic Conference play. After Willard took a 1-0 after scoring in the top of the first, Crawford went silently in the bottom of the frame. The Flashes would be kept scoreless throughout the remainder of the contest while the home team scored five in the second, six in the third and their final run in the fourth. Daylen Balliet pitched four innings to earn the win, giving up all four Willard hits, one earned run and striking out four. Ethan Sutter worked the final frame and struck out two. Caleb Lohr tallied Crawford’s only multi-hit game, delivering two singles that drove in three runs, scored a run and also swiped a base. Other offense for the Eagles came from: Cade Hamilton- 3B, 2R; Trevin Fairchild- 2R, 2SB; Gavin Feichtner- 1B, 2R, RBI, 2SB; Evan Spangler- 1B; Drayton Burkhart- 1B, 2R, SB; Balliet- R; Nolan McKibben- 1B, RBI; Carson Feichtner- 2B, R, RBI and Mason McKibben- 1B, R, RBI, SB. Monday’s meeting at Seneca East was moved to Tuesday afternoon with game two of the series at Crawford happening on Wednesday. On Thursday, April 18, the Eagles are scheduled to host the visiting Bucyrus Redmen in game one of their season series. NORTH ROBINSON —Colonel Crawford and Wynford wrapped their season series back on Friday afternoon. After the series finale between the two squads had to be moved to Crawford, the visiting Eagles would end up with the eight-inning victory; 5-4. The final score in game one of the series was also 5-4 in favor of the Eagles. Both teams finished with eight hits apiece while also stranding 11 runners each. Colonel Crawford finished with four errors while Wynford committed five. G. Feichtner worked three innings, giving up three hits and two runs (one earned) while waking five and striking out one. Hamilton tossed the final five innings en route to the victory, allowing five hits and two earned runs (one earned) while walking three and fanning five Royals’ hitters. Hamilton helped his cause by recording two singles at the dish and scoring two of the five Crawford runs. Other offensive statistics for the Eagles came from: Fairchild- 1B, R, SB; G. Feichtner- 1B, RBI; Burkhart- R; Balliet- 1B, RBI; C. Feichtner- 1B, R; Lohr- 1B and Brock Ritzhaupt- 2B, RBI. GALION — The Northmor Golden Knights baseball squad played just one game over the weekend and it was on their home field against the visiting, Knox-Morrow Athletic Conference leading East Knox Bulldogs on Friday afternoon. East Knox took care of Northmor back on Thursday by a final score of 11-2 and on Friday, the Bulldogs continued to roll, downing the Golden Knights in a shortened, six inning game; 12-1. With the loss, Northmor drops to 4-6 overall on the season, including 3-5 in the KMAC. East Knox improved to 12-0 overall and 8-0 in conference play with the victory. The Golden Knights recorded just three hits against Bulldogs’ pitching, scoring just the lone run and stranding five baserunners. East Knox plated their 12 runs on 15 hits, stranded eight and committed just one error. Northmor committed seven costly errors in the loss. The Knights avoided the shutout by scoring their run in the bottom of the sixth. Wyatt Reeder was dealt the loss, pitching two innings while giving up six hits and six runs (four earned), walking two. Chris Bood worked the final four frames, allowing nine hits and six runs (one earned) while walking one and striking out one. Hunter Mariotti, Pierce Lower and Brayden Black recorded a single apiece for the home team while Lower drove in the one runner, Ryland Thomas. Thomas recorded a stolen base on the day, as did Reeder for Northmor’s offense. Monday’s home game against another KMAC foe, the Mount Gilead Indians, was postponed until Thursday, April 18. The Golden Knights will hit the road to Mount Gilead on Tuesday. Following their series with Mount Gilead, Northmor will be off until Monday, April 22 when they are set to Centerburg for a conference meeting with the hosting Trojans. CRESTLINE — Back on Friday, April 12, the Crestline Bulldogs welcomed the Buckeye Central Bucks to their home field to compete in non-conference action. Unfortunately for the ‘Dogs, the Bucks brought their bats with them and headed back home after defeating their hosts; 23-5. With the loss, Crestline falls to 2-7 overall on the season and remain at 2-2 in Mid-Buckeye Conference play. The Bulldogs were set to play conference foes, the Loudonville Redbirds, on Monday. However, the game was moved to Wednesday, April 17, cancelling their meeting with the Ridgedale Rockets. On Tuesday, Crestline headed to Loudonville.